What is OLT OnLine Taxes? OnLine Taxes is a comprehensive, web-based tax preparation software designed to help taxpayer prepare federal tax returns for free via the IRS’s Free File Alliance. The platform provides a set of great feature which includes; free 1040EZ, 1040, and 1040A, simple & complex returns, Import prior year data, support of all forms and schedule, customer support (live chat and phone), Audit support, Year over year Comparison, and discounted state pricing. In addition, the software provides an IRS approved efile solution. The IRS efile is a safe, faster and easy channel to submit individual returns. Besides, it provides the fastest way to receive a refund via the direct deposit at no hidden cost. OnLine Taxes provide the most convenient way for taxpayers to submit state and federal returns for free. The platform offers a comprehensive service designed to meet individual and efile tax preparation needs. Its IRS efile solution offers the fastest way to get your tax refund. Besides, the program is an accurate, quick and easy alternative to paper tax preparation. With the security provided by Verisign, you will have no worry about your personal information. Moreover, all the information submitted is verified via Trust Safety thereby guaranteeing optimal security for every bit of information. OnLine Taxes provides audit support to help taxpayer to backup all their returns. Also, the ability to import prior year data make it easy to compare your year over submissions. OnLine Taxes has a user interface that features a series of worksheets for data inputs. Its navigation is characterized by checklists that provide links to the specific data/information input worksheet. 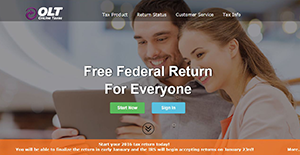 The top-level navigation tab which includes; file my return, federal, and state make it easy for taxpayers to jump to distinct sections of the platform. Besides, the second level navigation presents tabs for adjustments, income, primary information, credits, taxes, and deductions, tax summary, etc. For novice filler, it’s easy to use the software thanks to its help features. The platform has a glossary sidebar featured on the right-hand side to provide links to insightful articles on specific topics. The glossary adjusts to the information entered on the screen making it easy to find all relevant information. If you are interested in OLT OnLine Taxes it might also be sensible to check out other subcategories of Best Tax Software collected in our database of B2B software reviews. Companies have unique needs and requirements and no software platform can be ideal in such a condition. It is futile to try to find an ideal out-of-the-box software app that meets all your business wants. The smart thing to do would be to adapt the solution for your special needs, employee skill levels, finances, and other elements. For these reasons, do not hurry and invest in well-publicized leading systems. Though these may be widely used, they may not be the perfect fit for your unique wants. Do your homework, investigate each short-listed system in detail, read a few OLT OnLine Taxes reviews, speak to the seller for clarifications, and finally choose the app that presents what you need. How Much Does OLT OnLine Taxes Cost? We realize that when you make a decision to buy Tax Software it’s important not only to see how experts evaluate it in their reviews, but also to find out if the real people and companies that buy it are actually satisfied with the product. That’s why we’ve created our behavior-based Customer Satisfaction Algorithm™ that gathers customer reviews, comments and OLT OnLine Taxes reviews across a wide range of social media sites. The data is then presented in an easy to digest form showing how many people had positive and negative experience with OLT OnLine Taxes. With that information at hand you should be equipped to make an informed buying decision that you won’t regret. What are OLT OnLine Taxes pricing details? What integrations are available for OLT OnLine Taxes?